Welcome to the second day of the October Release from Taylored Expressions!! 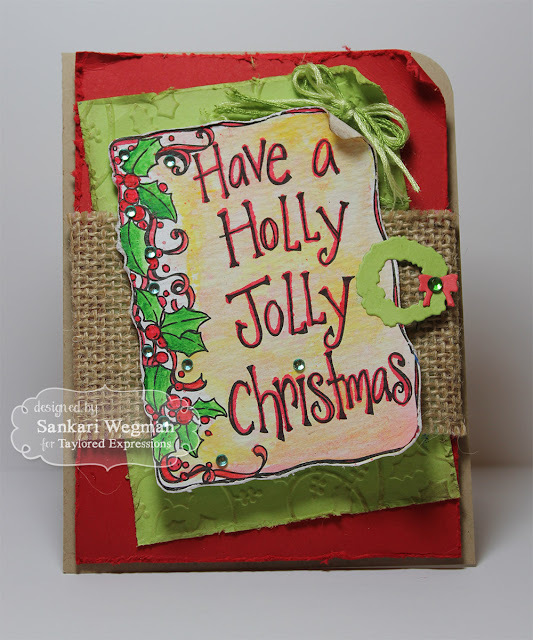 I love these new amazing holiday dies that will make your Christmas project making so much fun!!! Today I am so excited to show these cards that I made using all dies!! There is a very special new product that Taylor has created that is absolutely awesome: Water Color Panels !! It is a set of 12 black and white illustrations for Christmas that is perfect for watercoloring!! I was so surprised at how wonderful the ink was when I was watercoloring - nothing smeared or bled! 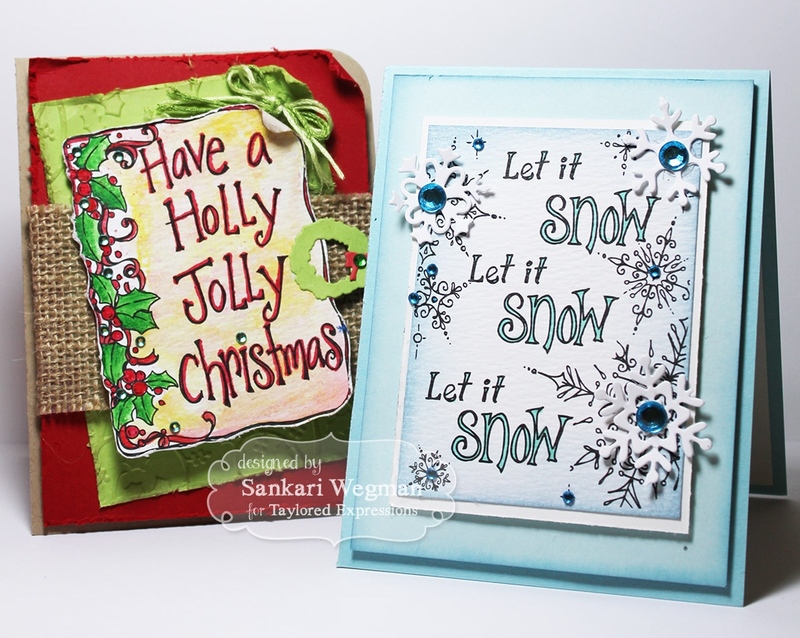 Each of these cards are 3" x 4" which is so perfect for cardmaking as well as making tags! I made two cards using these panels and can I just say that it was so much fun and therapuetic to watercolor!! Here is a closer peek at the first card. I had so much fun getting my water colors out and coloring - there is such a freeing feeling in coloring - that everything doesn't have to be perfect but can colors can run and flow into each other. I used the Holly Embossing Folder for the green cardstock and added a little wreath from the Holiday Arbor Accessories dies. 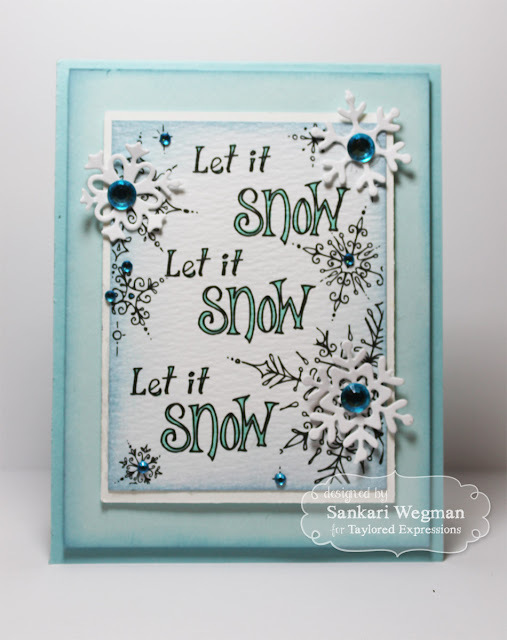 My last card has some snowflakes from the Make A Snowflake die set and was just light touched with some blue water colors and matted onto cardstock with some bling added to the centers - such a fun, simple and quick card to create! I have loved making projects for today's sneak peeks! Please make sure to stop by the TE blog today for more info and to hop over to everyone's blog today to check out their works of art! Thanks so much for stopping by today - hop by tomorrow for more sneak peeks!! Love your stacked skaters, too cute! What a lot of work! Beautifully done! Those stacked skaters are brilliant! Very cute! Great job in the cards. I meant on the cards, lol. Awesome cards. The snowflakes are beautiful.